Circular Walk around Toddington Motorway Services at Toddington Walking RouteA circular walk over arable and 'set-aside' land with fine views across the area. Start/Finish Point: The old pump on Toddington village green. Start Nat GR: TL 0099 2888. End Nat GR: TL 0099 2888. 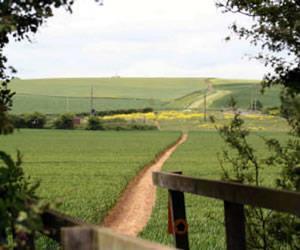 A circular walk over arable and 'set-aside' land with fine views across the area. How to get there by car/Parking: The A5120 passes through Toddington which is just under a mile south west of junction 12 of the M1. There is restricted and unrestricted on-street parking around the centre of Toddington. Other parking is available at the Village Hall, off Leighton Road, subject to functions.